In the late spring of 2008, seven local people began talking about the possibility of having a place to shag dance in Summerville. After months of thoughts and seeking a place, Lee Hoff found Mojo’s in the Bilo Galleria. After meeting with the owner, Stan Klein, it was agreed that we could meet on Monday nights for a period of one year to determine if there was any interest in the area. We met faithfully for several months with just a handful of participants. Of the original seven people, three remains, Lee and Deb Hoff, and Sharon Johnson. Lee and Deb teach our lessons and Sharon became our Club DJ. Slowly, but surely, interest and excitement followed. 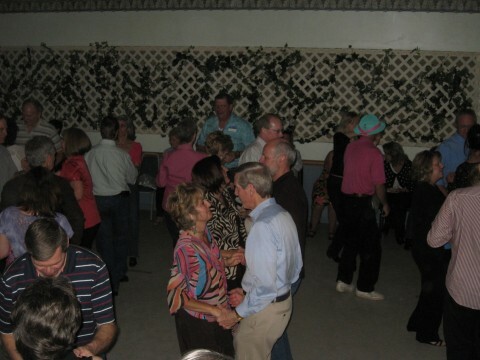 In August of 2009, we held our first dance at the VFW in Ladson and had 160 people. Soon after, we decided to form a club, Summerville Shaggers Shag Club, and have a dance every other month. The response was overwhelming. We have members from Summerville, Walterboro, Moncks Corner, Goose Creek, Dorchester, Charleston, North Charleston, Mt. Pleasant, St. George, Cottageville, Ridgeville, Lexington, Columbia, Ravenel, Edisto Island, Ladson, Johns Island, Hanahan, Pinopolis, and Bonneau. We are now up to 300+ members and have an event every month We are very proud of our “friendly” atmosphere and have become an extended family. **Please note our free lessons every Monday night with open dancing following lessons until 9:30 pm. Our club now meets at the Summerville Country Club which is open to the public. We have snacks and a cash bar on Mondays nights. Also food available for purchase in the club house. All of our monthly band or dj events range in ticket price and all of our events have food available for those who would like to eat. We enjoy sharing our love for the State dance “Carolina Shag” , being with friends and meeting new ones. We have continued this for 10 years and have no thoughts of stopping. We do it for the love of the dance, the music and the people.